When a user receives an SMS or MMS message from an unknown sender, the Messages app can ask your Message Filter app extension to determine whether the message is unsolicited or otherwise unwanted. Your app extension can make this determination by using its own built-in data and logic or by deferring to analysis done by your associated server. IdentityLookup works only with SMS and MMS messages from unknown senders; it doesn't work with messages from senders in a user's Contacts list or with iMessage messages from any source. 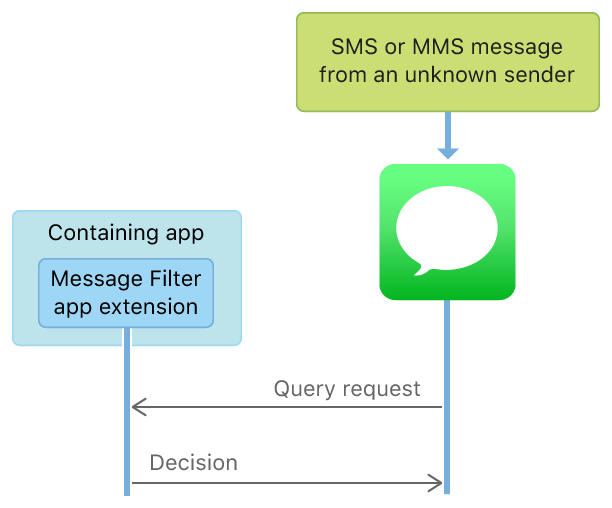 To find out if a message from an unknown sender is unwanted, the Messages app launches the currently enabled Message Filter app extension and queries it, as shown in Figure 1. The Messages app uses an ILMessageFilterQueryRequest object to pass information about the message to your Message Filter app extension. If your app extension can determine whether the message is unwanted, it returns its decision to Messages in an ILMessageFilterQueryResponse object. If your app extension can't make this determination by itself, it tells Messages to send the information about the message to a server associated with your app. Your server examines the message information and sends a response to Messages, which passes the response to your app extension. The app extension parses the server's response and returns the final decision to Messages in an ILMessageFilterQueryResponse object, as shown in Figure 2. For privacy reasons, the system handles all communication with your associated server; your Message Filter app extension can't access the network directly. Also for privacy reasons, your app extension can't write data to containers shared with the containing app. Create an app extension that helps identify unwanted messages. The extension context for a Message Filter app extension. The abstract base class for the principal class of a Message Filter app extension. 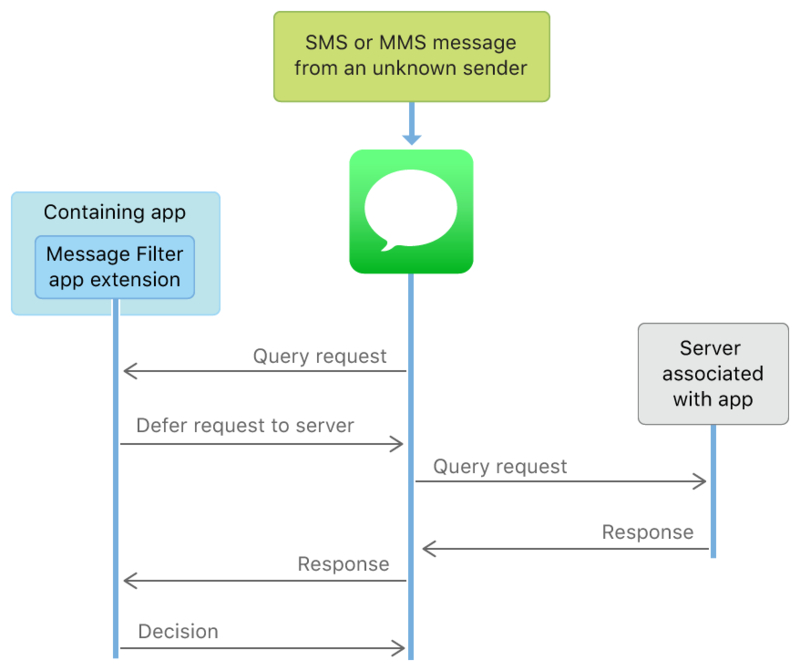 A request for a Message Filter app extension to determine the status of a message received from an unknown sender. A set of methods implemented by a Message Filter app extension to handle query requests. A response to a message filter query request. A response to an HTTPS network request performed on behalf of a Message Filter app extension. An action to take in response to a received message. An error type that indicates problems with network requests and responses related to IdentityLookup APIs.